Kenneth Berding, Bible Revival: Recommitting Ourselves to One Book (Wooster, OH: Weaver, 2014). Back in the 1970s a book called The Battle for the Bible was a clarion call to return to biblical fidelity. Although not perfect, many heard that call. 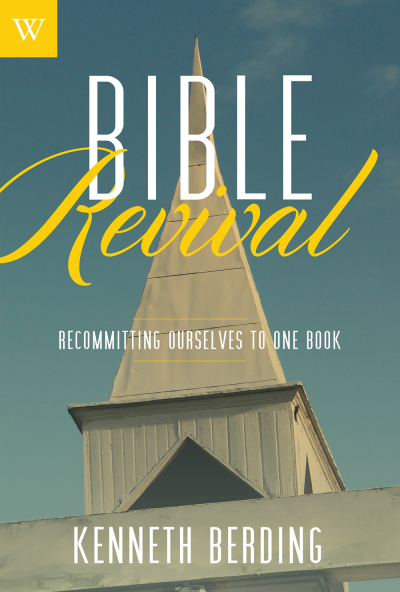 I see Kenneth Berding’s Bible Revival: Recommitting Ourselves to One Book in the same vein. “This book answers the question of why we need a revival of the Bible in our generation and what it will take to see it happen” (p. 12). The author is a professor of New Testament studies at Talbot School of Theology, Biola University. This work is clearly and concisely written (128 pp.). These two characteristics make it a good resource for classes and small groups. Each chapter concludes with a prayer and review questions to further help facilitate this purpose. I appreciate the author’s passion for and commitment to the Bible. For many who will likely read this book, Berding will probably be “preaching to the choir.” But every now and again, the choir needs to be reminded that we are in a battle for the Bible. You can read an excerpt here. You can also access an interview with the author here. Much thanks to Weaver Books for providing the free review copy used in this unbiased review.